Universal Studios Orlando - Ride the Movies! Universal Studios Florida is the second largest resort theme park in the Orlando area, after Walt Disney World. Universal Orlando consists of Universal Studios Florida and Islands of Adventure, as well as Universal CityWalk Orlando for night-time entertainment. Universal Orlando is just minutes north of Vista Cay Resort at 1000 Universal Studios Plaza, Orlando, FL 32819. Halloween Horror Nights at Universal Studios - one of the scariest and largest Halloween events in the country. Rock the Universe - annual Christian rock music festival in September. Summer Concerts - Saturday evenings with a variety of popular musicians and groups. Go straight to the park gate! Purchase your tickets before you head to the park. Online ticket purchases come with a free online coupon book redeemable for up to $150 in park food, merchandise, hotels and more! Transportation for guests of Universal Orlando is well organized, and the system uses boats, water taxis, buses, escalators, moving walkways and walking paths so that guests can get to and from onsite hotels. The Super Star Shuttle is also available to transport resort guests to and from hotels. You don't have to stay far away from Universal Studios to find an affordable vacation rental option! Look no further than Vista Cay Resort, just minutes from Universal. 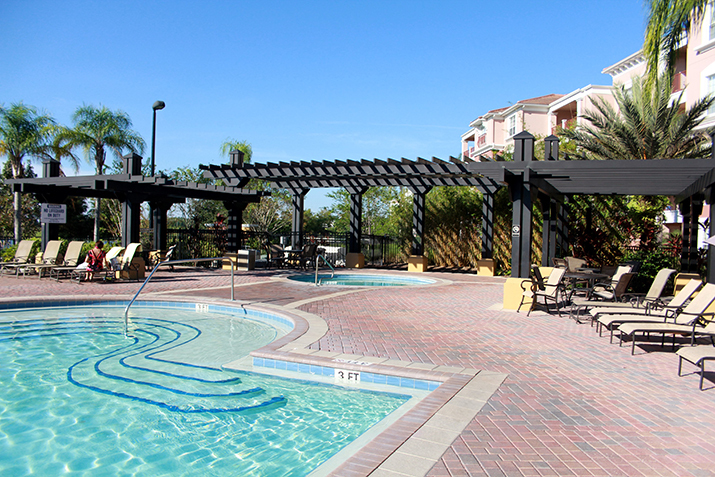 We offer plenty of affordable Orlando vacation condos and townhomes, all within minutes of the major attractions including Universal Studios, the Orange County Convention Center, Disney World, and SeaWorld. Condos and townhomes range from $100 - $149 per night during the off-season and $179 - $229 during peak season. At Vista Cay Resort, we offer luxury condos and townhomes with up to three bedrooms and bathrooms, and capacity for up to 10 people. Fully furnished, top of the line amenities (including three pools) and all just minutes from Orlando, Disney World, Universal Studios, SeaWorld. And, we have a golf course just across the street! Relax and enjoy the vacation of a lifetime in Central Florida at Vista Cay Resort, all for between $100 and $149 per night.